Paul Gauguin Cruises invites guests aboard the m/s during the August 7th sailing to Tahiti and the Society Islands, as well as the August 14th sailing to the Society Islands and Tuamotus, to participate in a learning opportunity that covers an incredible range of photographic challenges and lessons through an elite photographic tour of the paradise that is French Polynesia. Celebrated photographers Jesse Kalisher and Roger Paperno and accomplished graphic designer and artist Helen Kalisher share their knowledge about their art as they lead an unparalleled photo-expedition that covers everything from tropical flowers and white-sand beaches to magnificent views of Cook’s Bay, Mt. Rotui, and an ancient Tahitian stone temple. The course will cover every aspect of photography on islands that deliver one amazing photograph after another. Famed photographer Roger Paperno believes in the “Zen of photography,” and how emotion and energy can impact a photograph. His class teaches photographers how to approach each photo with a calm, clear state of mind to improve the quality of their work. Paperno will teach guests about basic photography and techniques, and will also illustrate how the feelings behind the photo are essential to the art of photography. Jesse Kalisher will engage his fellow photographers in an exploration of how he sees the world through the camera lens, as well as basic tips and tools for every level participant. Kalisher has taught this class around the world and believes that the secret to capturing fantastic photos is found in the joy of the moment. He will share some tips that have made his photography famous, coveted by museum curators around the world. Helen Kalisher teaches the basics and tricks of Photoshop, where she has created logos and web pages for Apple Computer and travel guides for Dorling Kindersley. Kalisher has successfully combined an artist’s eye with her love of photography, translated through her mastery of Photoshop. The photographic tour also includes exclusive shore excursions, private portfolio review, a hosted dinner, and round-table discussions. The cost for the photography workshops are $350 per person. 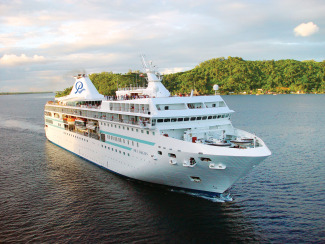 For rates and reservations for Paul Gauguin Cruises, contact a Professional Travel Agent, call 1-800-848-6172, or visit www.pgcruises.com.